SANTA CRUZ, CA. 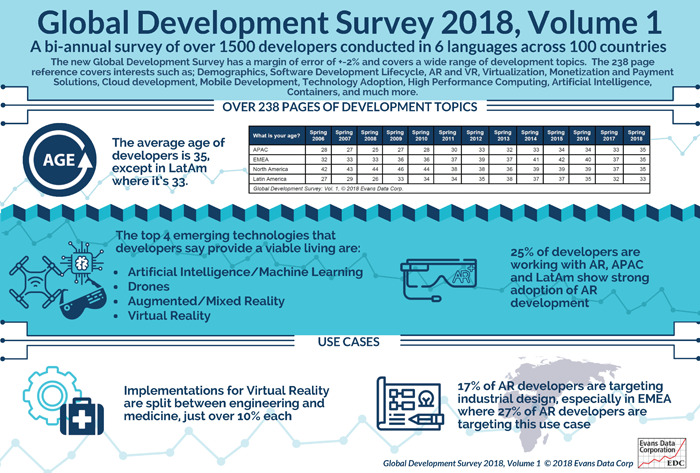 May 22, 2018 The number of developers who are working with augmented reality (AR) in some capacity is increasing and now tops 25%, according to Evans Data’s recently released Global Development Survey. The survey, conducted in over 100 countries and in six different languages, showed that augmented reality functionality within apps is being adopted particularly strongly in emerging market regions in APAC and Latin America. Of those developers working with AR, the overall leading use cases are within the field of industrial design, selected by 17% of AR developers. This use case was particularly strong in the EMEA region, where 27% of AR developers cited this as a target area. In different news, the top implementations for Virtual Reality among developers are split between engineering (10.6%) and medicine (10.5%) in a fractured field where the rest of the possible use cases garnered no more than single digit response sums. The new Global Development Survey has a margin of error of +-2% and covers a wide range of development topics. The 238 page reference covers interests such as; Demographics, Software Development Lifecycle, AR and VR, Virtualization, Monetization and Payment Solutions, Cloud development, Mobile Development, Technology Adoption, High Performance Computing, Artificial Intelligence, Containers, and much more.